Discover how to download an app from BlackBerry World on your BlackBerry Z10. Learn how to uninstall a BlackBerry World app from your BlackBerry Z10. Discover how to add a Facebook account on your BlackBerry Z10. Learn how to log out of Facebook on your BlackBerry Z10. Learn how to post a Facebook status update using your BlackBerry Z10. 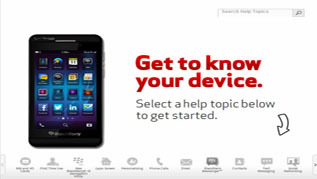 Here's how to contact app developers using your BlackBerry OS 10 device. A visual guide to view current traffic on your BlackBerry Z10. Learn how to find nearby places on your BlackBerry Z10. Learn how to add a Twitter account on your BlackBerry Z10. Learn how to tweet using Twitter® on your BlackBerry Z10. Here's how to backup and restore your Verizon Cloud content on your BlackBerry 10 device.